during a break or after the competition. opponent is not acceptable or permitted in any sport. 4. Work equally hard for yourself and/or your team. Your team’s performance will benefit, so will you. 5. Be a good sport. Applaud all good plays whether they be by your team or the opposition. 7. Co-operate with your coach, team mates and opponents. Without them there would be no competition. 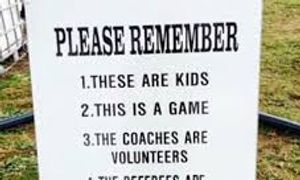 8 Play for the fun of it, and not just to please parents and coaches. 1. Remember that children play sport for their enjoyment, not yours. 2. Encourage children to participate, do not force them. 3. Focus on the child’s efforts and performance rather than winning or losing. 6. Remember that children learn best by example. Applaud good plays by all teams. 7. Support all efforts to remove verbal and physical abuse from sporting activities. 8. Respect officials’ decisions and teach children to do likewise. 1. Remember that children participate for pleasure and that winning is only part of the fun. 2. Never ridicule or yell at a child for making a mistake or losing a game. 3. Be reasonable in your demands on young players’ time, energy and enthusiasm. 4. Teach your players to follow the rules. 5. Whenever possible, group players to ensure that everyone has a reasonable chance of success. 6. Avoid overplaying the talented players. The just-average need and deserve equal time. 8. Develop team respect for the ability of opponents and for the judgement of officials and opposing coaches. 1. Compliment and encourage all participants. 2. Be consistent, objective and courteous when making decisions. 3. Condemn unsporting behaviours and promote respect for all opponents. 4. Emphasise the spirit of the game rather than errors. 5. Be a good sport yourself. Actions speak louder than words. 6. Remember, you set an example. Your behaviour and comments should be positive and supportive.